Pegasus engaged with Rasul in June 2012 after competing against Paul Lewis our ERP Recruitment Director on a number of client requirements, he has shown super consistancy in placements within the Oracle Applications market. Rasul Mustofa has been working in the Oracle Applications e-business suite market for the past 7 years as a recruitment consultant, primarily on a permanent basis coupled with some interim contract activity. The depth of his career was at Sovereign Business Services where he spent 6 years of his career. Seeking something new he moved onto 2 more companies in short succession however could not settle, did not find exactly what he was looking for... In the end he felt that he was just too limited by working on a PAYE basis, standard commission structures and ultimately owing his day to day life to a recruitment company... He then undertook several interviews with strong ERP recruitment companies which he achieved several offers for... Rasul had also contacted Paul Lewis on LinkedIn after he noticed a link to the Pegasus Passport on the Pegasus website. 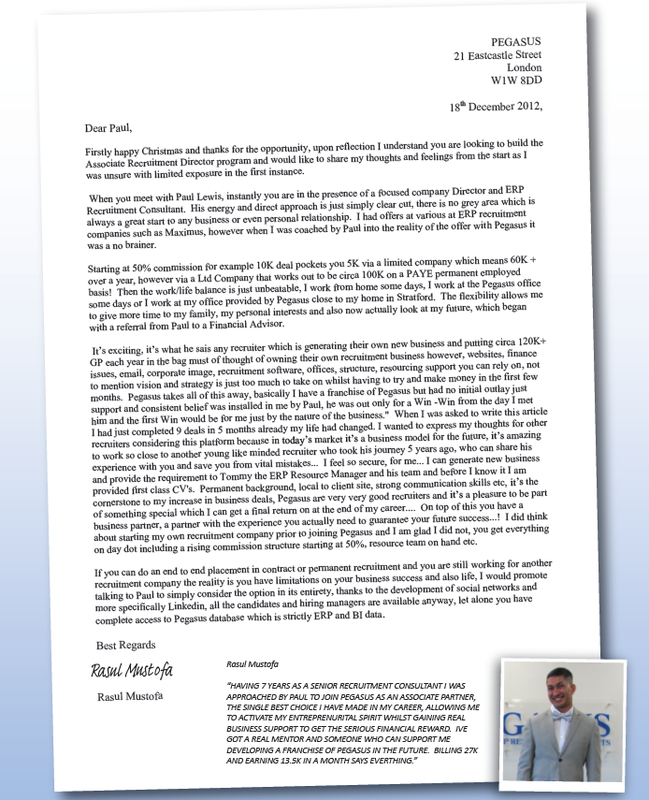 Please see a testimonial from Rasul attached on the opportunity at Pegasus which he can now reflect on and show others. Very commendable.